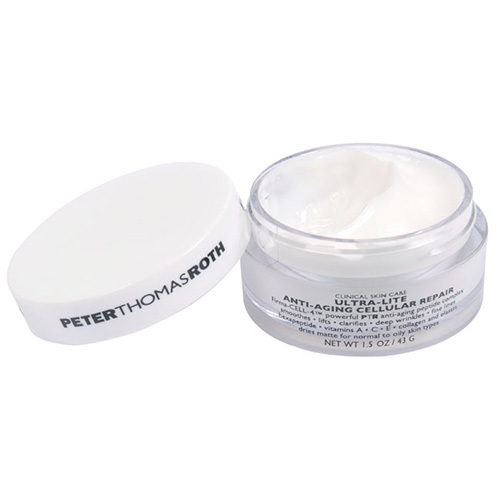 Peter Thomas Roth Ultra Lite Anti Aging Cellular Repair contains Firma-CELL-4, a powerful PTR anti-aging peptide and neuropeptide complex that smoothes, lifts and clarifies deep wrinkles and fine lines. It also contains hexapeptides to help boost collagen and elastin synthesis and dries matte for normal to oily skin types. This breakthrough combination of ingredients helpd to reduce the severity of deep wrinkles and fine lines by targeting muscle groups while boosting collagen and elastin. Provides the skin maximum smoothness & firmness for an overall more youthful appearance. pH level 4.0 - 5.0. For normal to oily skin types. Especially for skin that displays early signs of aging and mature skin with more defined wrinkles and fine lines. Clinical studies prove that within 3 months this product reduces the appearance of deep wrinkles.